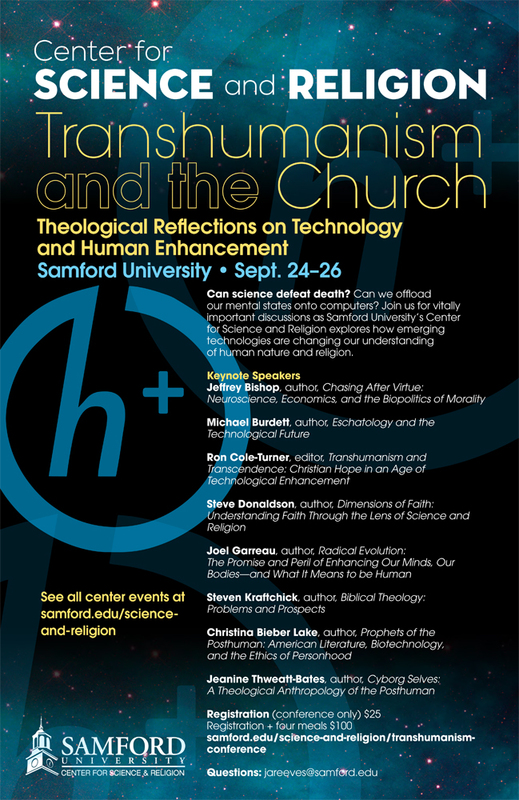 Samford University’s Center for Science and Religion will host a conference on “Transhumanism and the Church: Theological Reflections on Technology and Human Enhancement” September 24-26. Transhumanism is the movement that embraces the opportunity to transcend humans’ physical and mental limits through new technology. Its most optimistic advocates predict a future in which death has been defeated through the power to reverse biological processes or offload mental states onto computers. The Samford conference, funded by a generous grant from the John Templeton Foundation, will consider the ways the church might respond to Transhumanism and the technologies that could revolutionize our understanding of human nature. Full Registration is $100.00, with includes four meals (Lunch on 9/25 and 9/26 and Dinner on 9/24 and 9/25). Registration without meals is $25.00. Questions may be sent to jareeves@samford.edu.